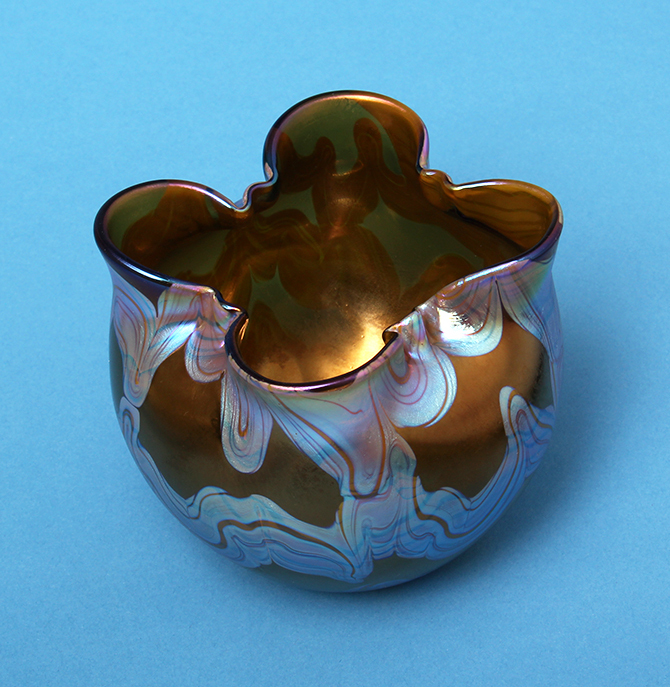 This is very cool, loose decoration for Loetz. 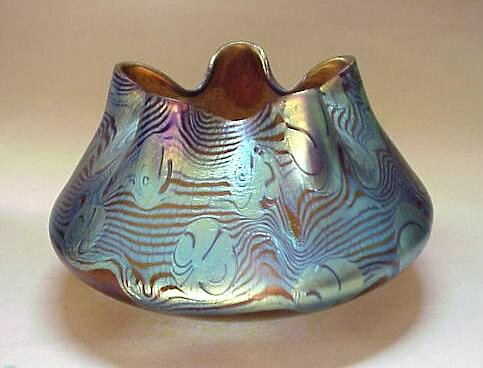 Excellent color and iridescence. Unsigned, but obviously Loetz. 5¼" tall. 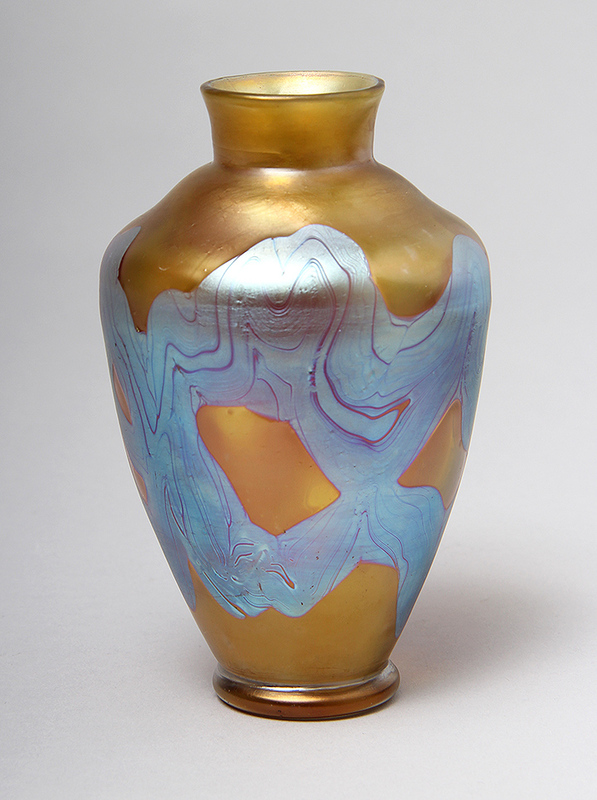 For some reason, Loetz only signed a relatively small percentage of their vases. They don't have to be signed, but it's nice when they are, as this example. Generally I find the quality just a tad higher. 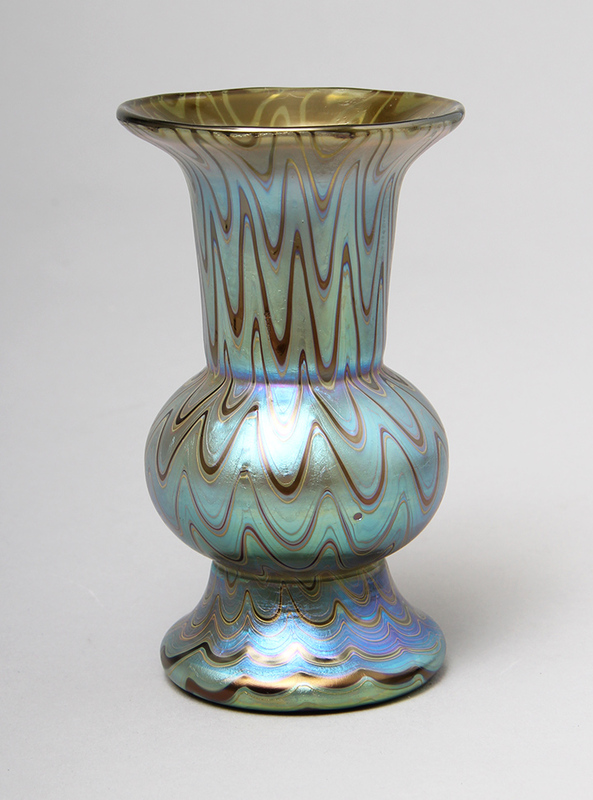 This little beauty, 4¾" tall, is one example. 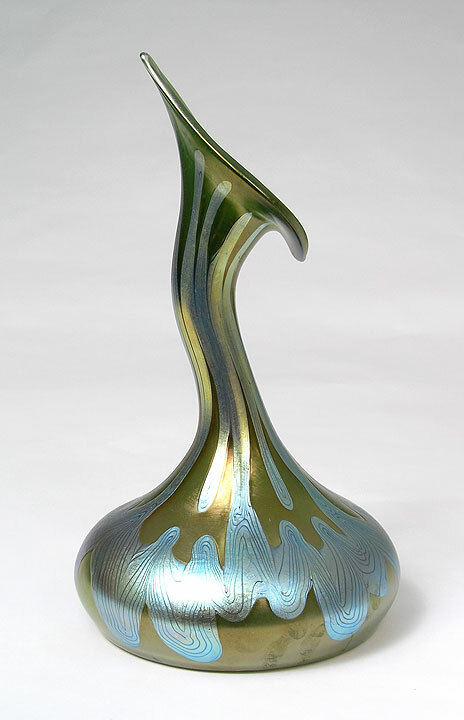 The wave decoration, with excellent iridescence, is carefully done on this very nice quality vase. Beautiful "Loetz Austria" signature on the underside. Mint condition. 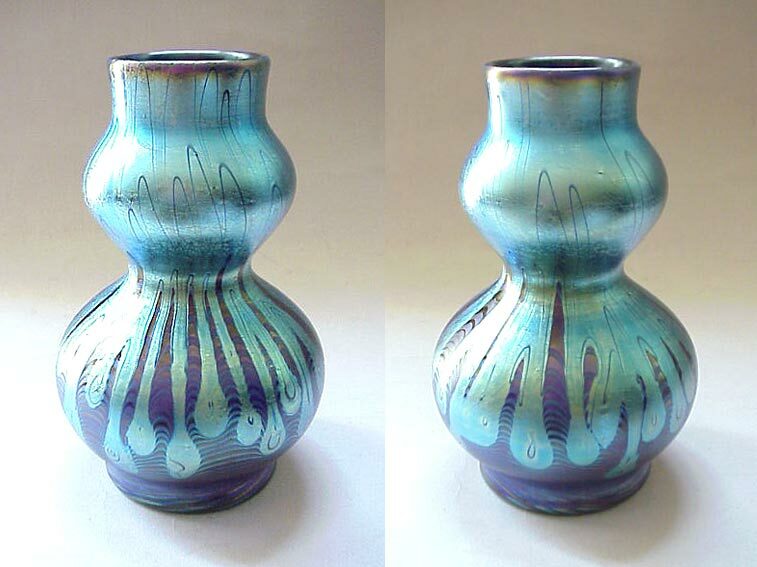 Fine quality vase with excellent color and decoration. 5½" tall. Unsigned. Mint condition. 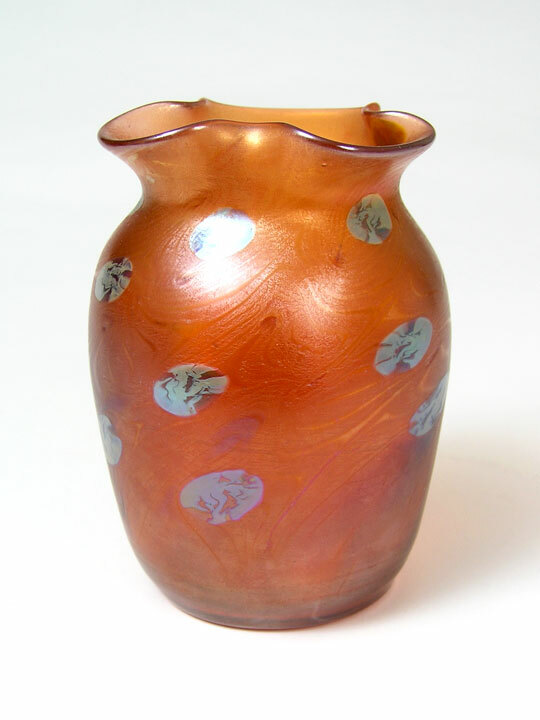 Just got this great signed Loetz decorated vase from the same private collection as many of the Tiffany Studios items I just purchased. 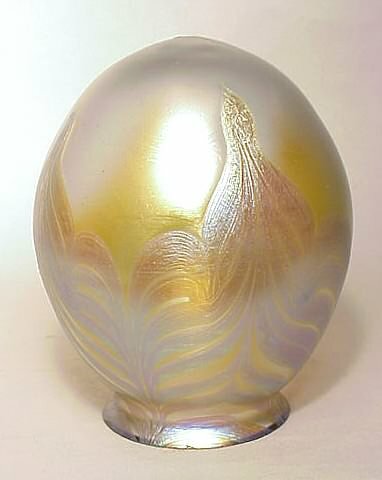 Killer decoration, wonderful shape, superb workmanship. 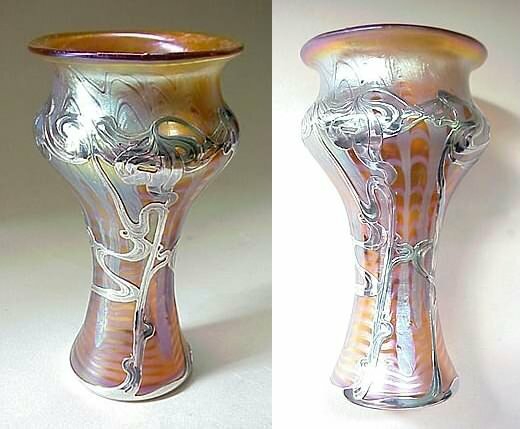 6" tall x 6" diam. Mint condition. 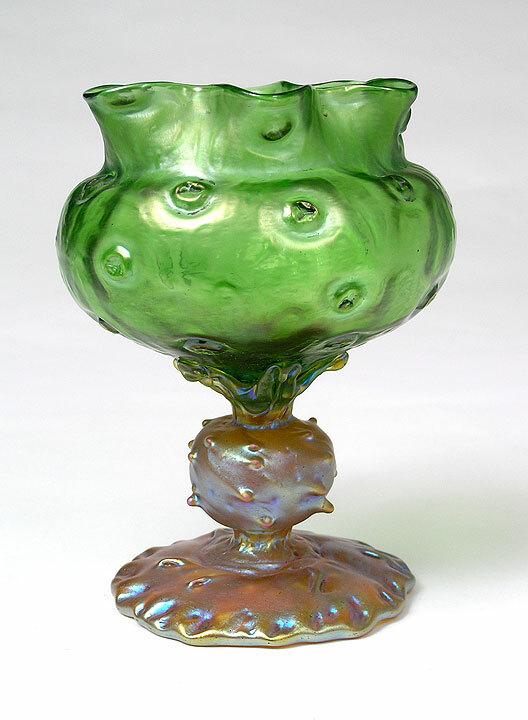 Beautiful Art Nouveau floriform vase with a green slightly iridescent body with prunted decoration. 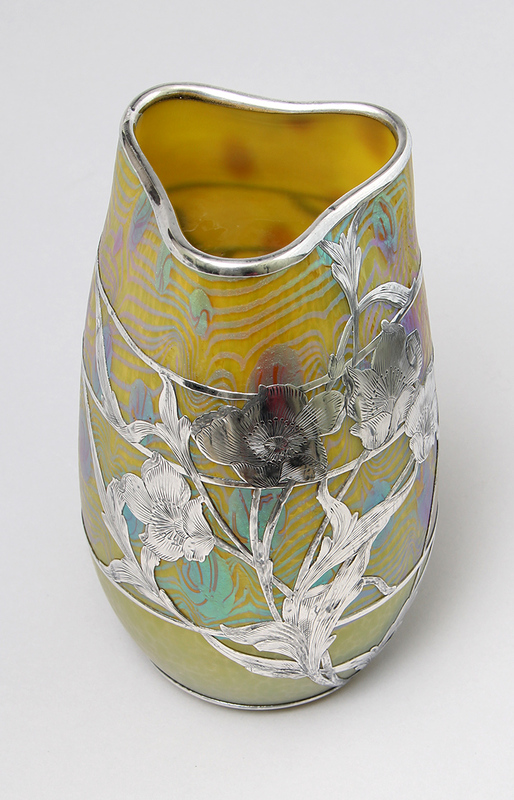 The highly iridescent foot with pulled thorn-like decoration. 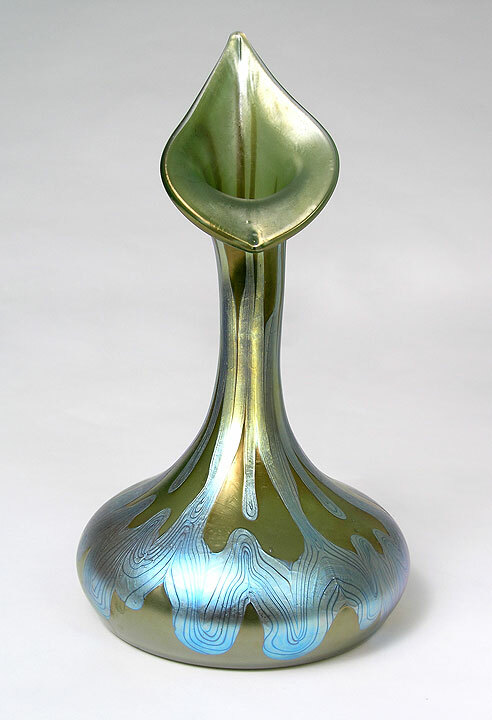 This vase is almost a pair to the vase above but differs in that there are more prunts on the body and less iridescence on the foot. The attachment to the body also differs slightly. 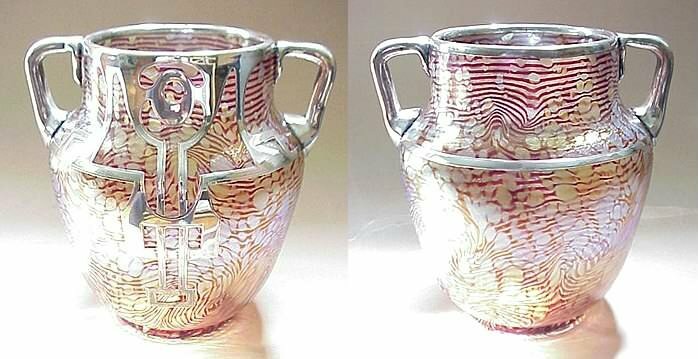 The two vases were probably made at the same time and show the differences when vases are blown by hand. 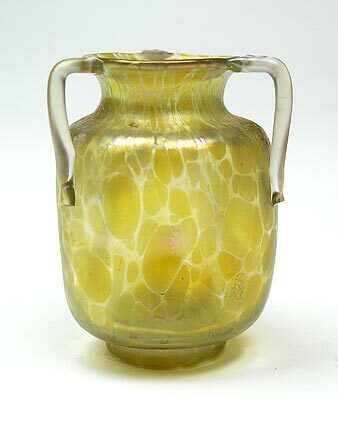 Another very nice vase at a very reasonable price. 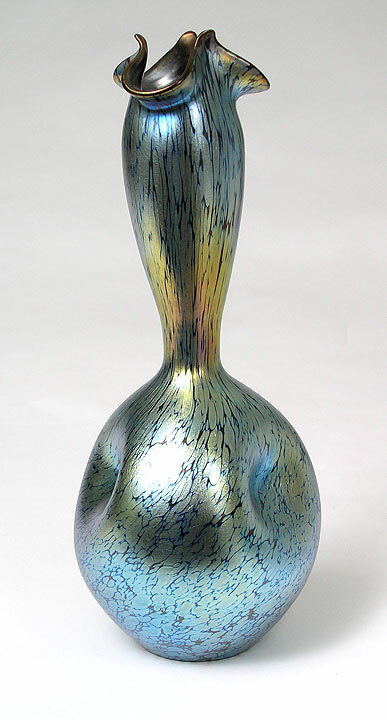 6½". Unsigned. Mint condition. 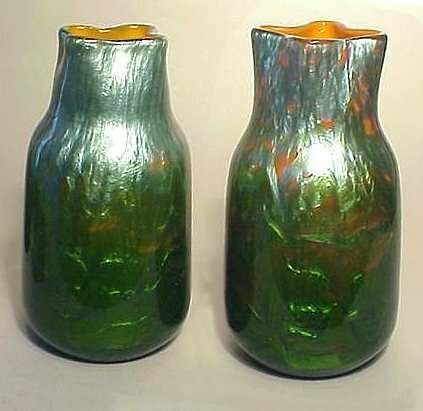 Pair of beautiful Art Nouveau floriform vase with a green slightly iridescent body with prunted decoration. 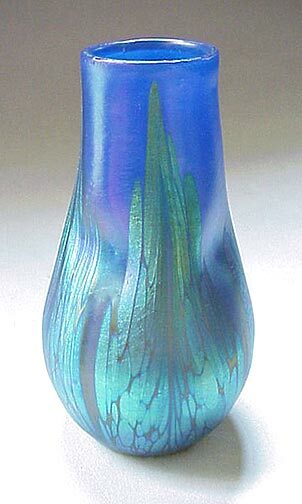 The highly iridescent foot with pulled thorn-like decoration. 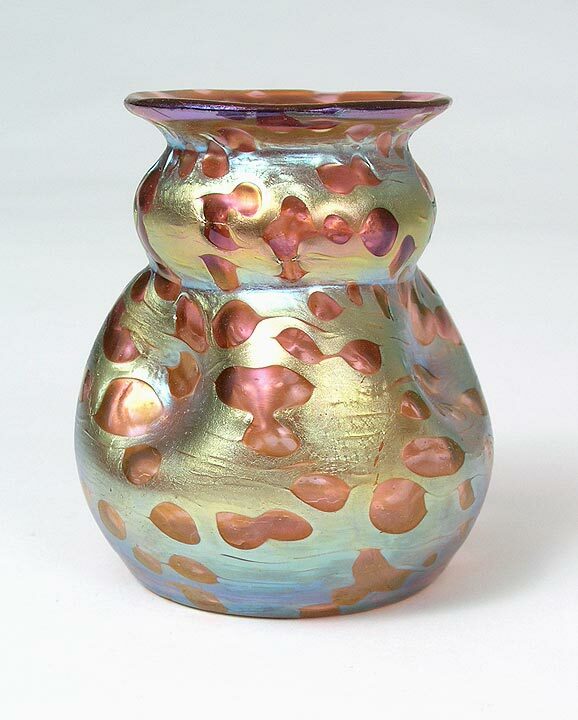 A very nice vase at a very reasonable price. 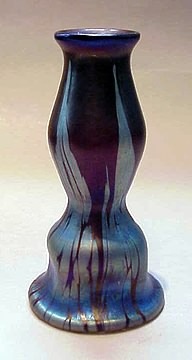 6½". Unsigned. Mint condition. 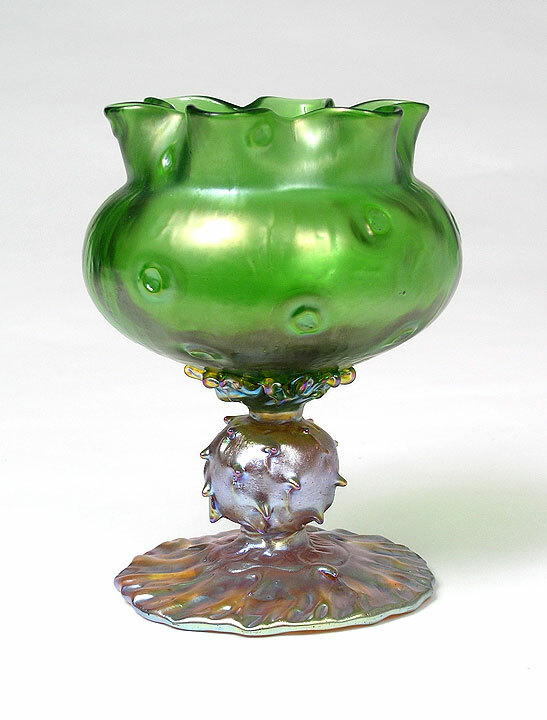 Just an extraordinary example of Loetz's work at their best. 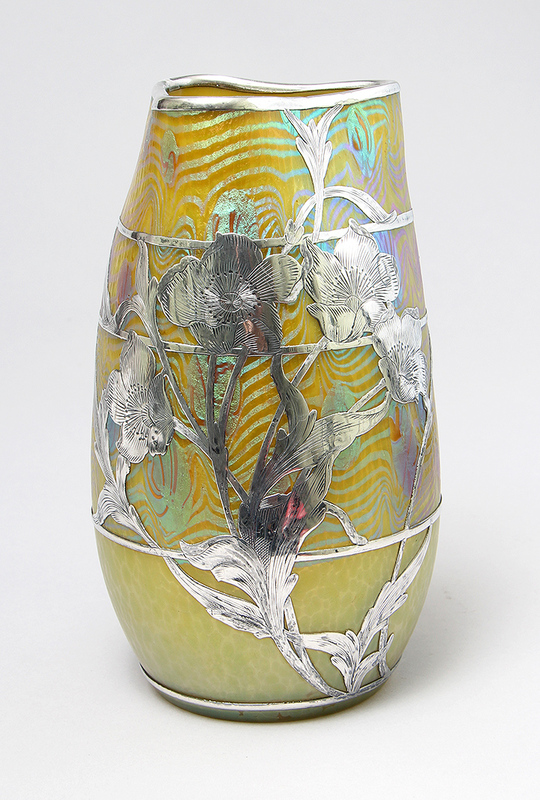 Fantastic Jack form, fully decorated. Nice big size at 14¼". Unsigned, but no question as to the maker. Mint condition. 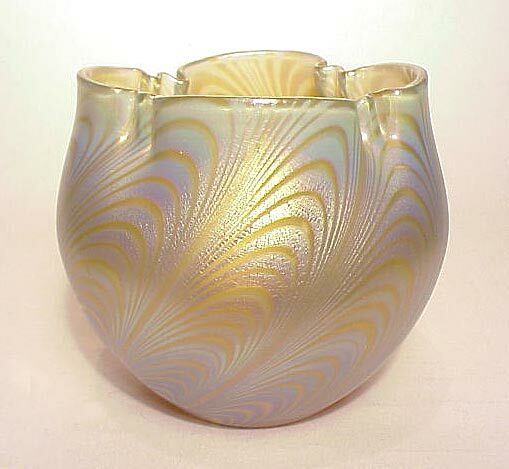 Very nice color and iridescence on a beautiful form. Best of all the decoration is on a red body that can be seen when held up to the light. Nice big size at 14½". Unsigned. Mint condition. 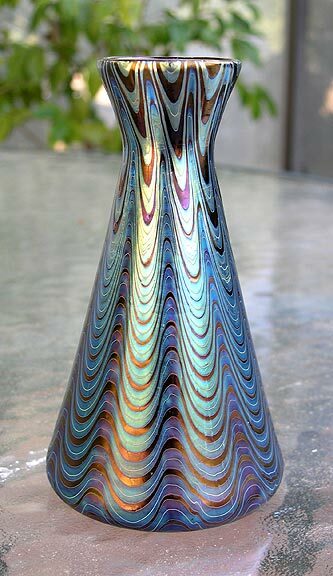 Change your tune on this vase! 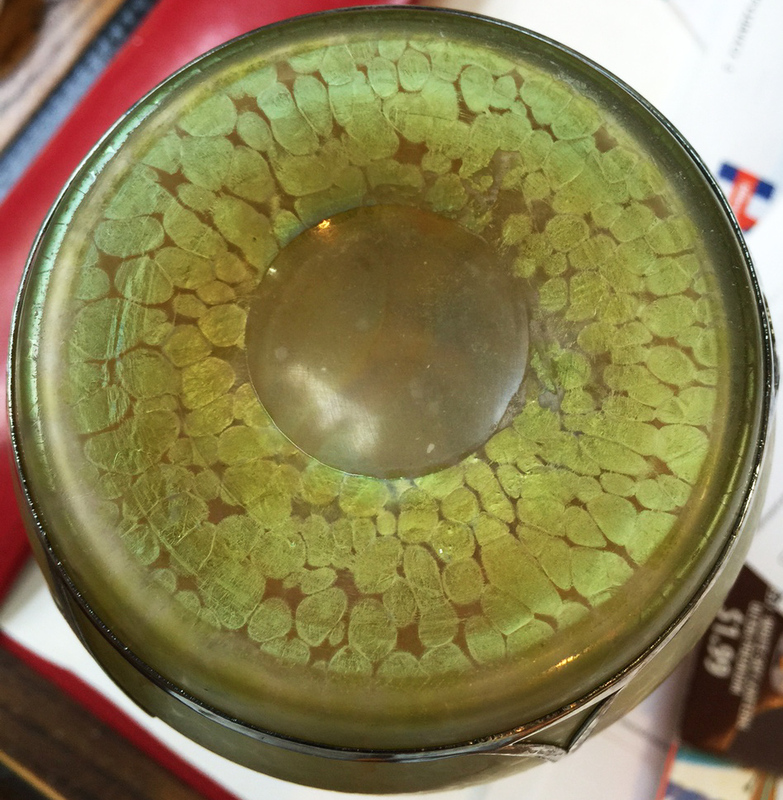 It's a great Loetz vase without the silver overlay and important with it. It's one of the best I've had in quite some time. 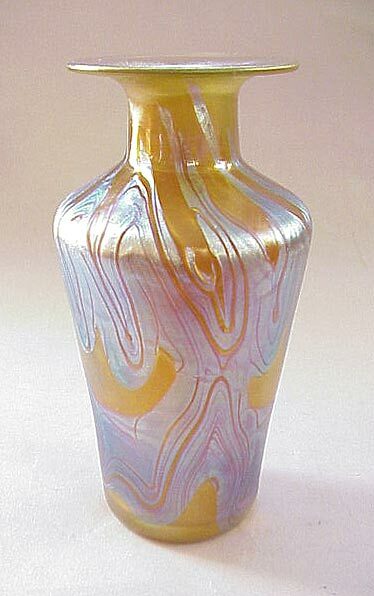 Nice size at 8" tall. Unsigned, but no question as to the maker. Mint condition. 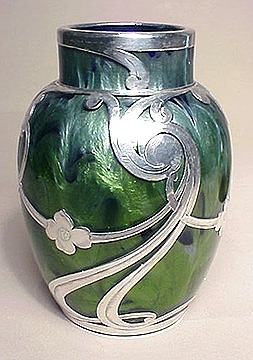 Great Art Nouveau twisted vase. 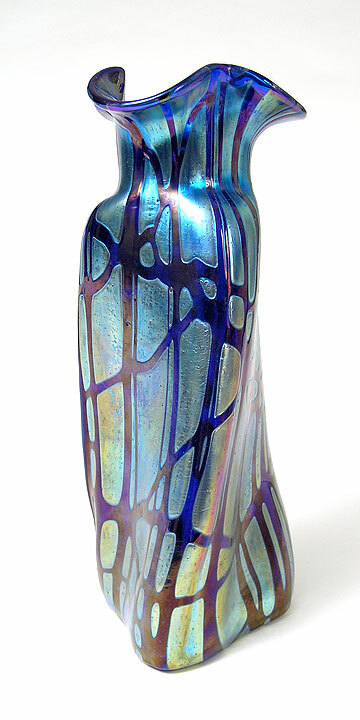 Silvery-blue iridescent decoration on a vivid sapphire blue ground. Austrian, unsigned, wonderful quality, but not Loetz. Nice size at 9¾". Mint condition. 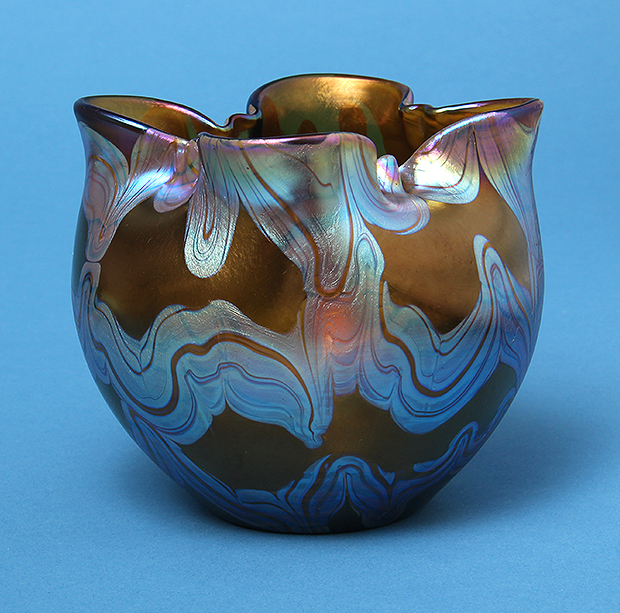 Beautiful miniature vase with 3 applied handles. 2¾". Perfect condition. Unsigned. 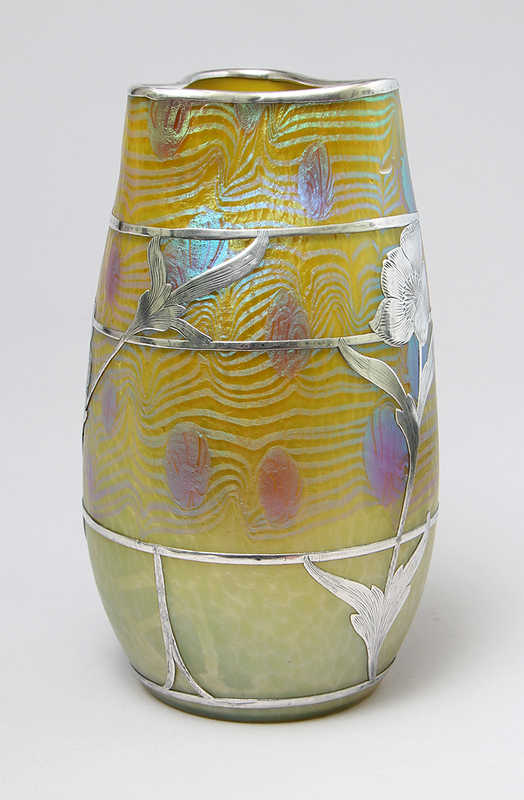 Fine quality vase with excellent peach color and silver iridescence -- better than the usual run-of-the-mill vase. 4". Unsigned. Mint condition. Beautiful decoration on a wonderful shape with a trefoil mouth. The silvery decoration is called "monnaie du pape" in French, literally translated as "the pope's currency" but better known as the silver dollar plant. It's well done on a salmon colored background with overall vine trailings. 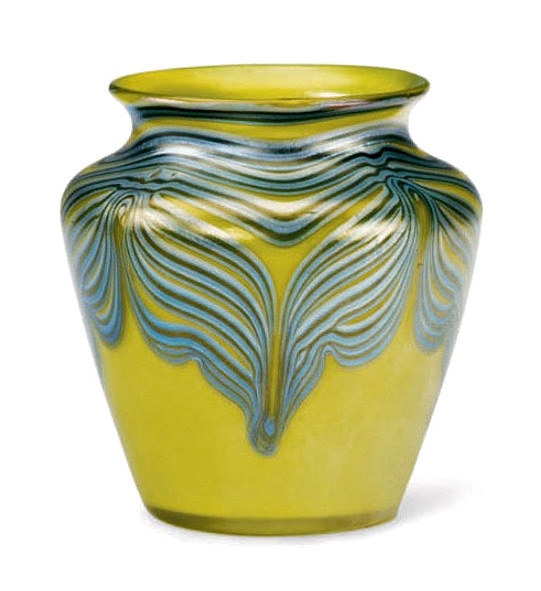 The vase is by Loetz, unsigned, as are many Loetz vases. 5¼". Mint condition. 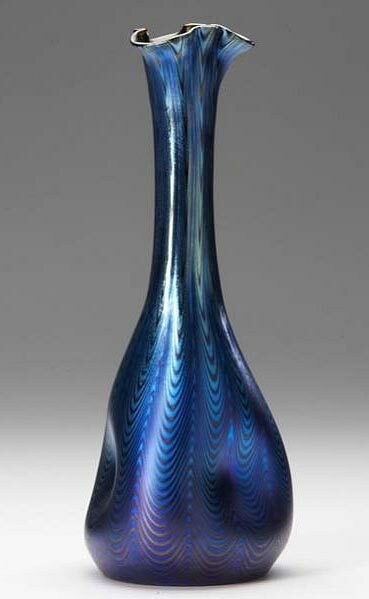 Superb quality vase with excellent blue to purple color and strong iridescence on a red base glass. (Can be seen when held up to a strong light.) Wonderful shape. 9½". Unsigned. Mint condition.